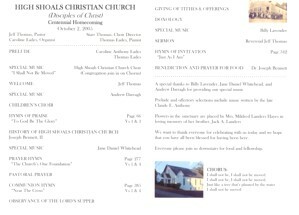 High Shoals is a small community on the <?xml:namespace prefix = st1 ns = "urn:schemas-microsoft-com:office:smarttags" />Apalachee River at the junction of three counties: Oconee, Morgan & Walton. 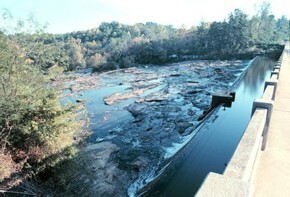 The river has picturesque shoals at the junction. When I was in the Army and met folks from all over, I would mention High Shoals when discussing my home county. A number of folks, especially UGA graduates, knew something about the “Shoals”. At one time, the town had a large cotton factory, High Shoals Manufacturing, on the river, I believe on the Morgan County side. The factory burned in the early 1900’s and the community lost population. In the late 1960’s, community leaders sought legislation re-incorporating the community as Town of North High Shoals, which is entirely in Oconee County. About the time of the reincorporation or just before, the factory area, dam, water rights and a number of houses were sold by Georgia Power Company. The new owner of the Shoals area established a fence and recreation area and only allowed access upon payment of admission fees. This created a stir among the “old-timers” who always had open access to the River. The State had about 100 feet of Right of Way across it for GA Highway 186. That allowed fishing and viewing from the bridge even after the fence went up. High Shoals had three churches, High Shoals Christian, located on the Oconee County side; High Shoals Baptist on the Walton side of the river and road (GA 186) and High Shoals Methodist on the Morgan County side. The Baptist and Methodist Churches were across the road from each other. Many anecdotes and legends have originated from that situation. A favorite story goes like this: one Sunday, one congregation was singing “Will there be any stars in my Crown?” and the other congregation was singing “No, Not a One”. The song names may be a little different but the point is the coincidence of the songs. I attended school with a number of High Shoals residents, including the Morgan and Walton folks near the River. 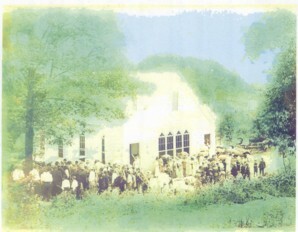 Reverend E. N. Anthony, local minister of renown, hailed from High Shoals. Many folks have fond memories and friendships from this little community. Many family names come to mind: Anthony, Landers, Lord, Lovern, Thomas, Shelnutt and others. In more recent years, the Bennetts at Family Life Enrichment Center have been prominent residents. Joe and Joan Queen, Mae and Russell Conley and many others have lived and worked there. High Shoals is also home of two Oconee activists of the last 20 years: “Delta is ready when you are” Donald and Violet Dawe. I have many fond memories of High Shoals. This area has a lot of Christian Churches, Disciples of Christ, many established by evangelist Erastus Shelnutt. I grew up at Union Christian Church and our youth would visit each other’s churches. Louisa Nunn was a very longtime and active member of the church. Long-time friend, the late Jack Landers, also attended the Christian Church. High Shoals Christian holds many memories for many persons. The town’s population swells for the annual Homecoming. 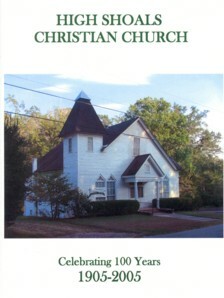 Many showed up on Sunday October 2, 2005, at the Christian Church to celebrate its centennial. High Shoals has a storied and interesting past. Its location and the river provide a uniqueness that many folks have enjoyed and appreciated.